Integrated business card holder for easy reordering or advertising. Dispenses all roll paper qualities, including 100 percent recycled paper. Durable back and front cover made of high impact resistant plastic to withstand normal everyday use. Best battery life in the industry. Integrated hubs and electronics make this dispenser easy to load and use. Perfect for tight spaces such as foodservice/hospitality areas, hand washing stations, industrial applications and schools/universities. Up to 25 percent smaller than most electronic dispensers. 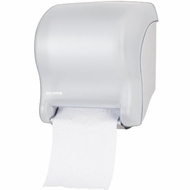 Tear-N-Dry essence is an electronic hands free dispenser that provides quick paper delivery; consistently dispensing 10" length towels without a wait. The Tear-N-Dry essence is simple to use and requires no adjustments, making it easy to load, use and refill with the universal paper of your choice. Reliability and best battery life also make essence the right choice to reduce maintenance and battery costs. One 8" wide roll; 8" diameter and 4" stub roll capacity. 1-1/2" Core Diameter. Measures 11-3/4" width by 14-7/16" height by 9-1/8" depth.